your pup. His likely involves digging holes, creating pathways, and marking his territory—yours are probably a little different. 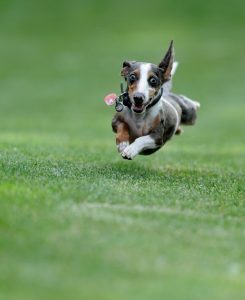 For those of us who want to have a beautiful lawn and own 1 (or 10) dogs, there is still hope. Artificial Pet Turf provides a surface that looks and feels like a 100% natural, well-maintained lawn without the drawbacks. 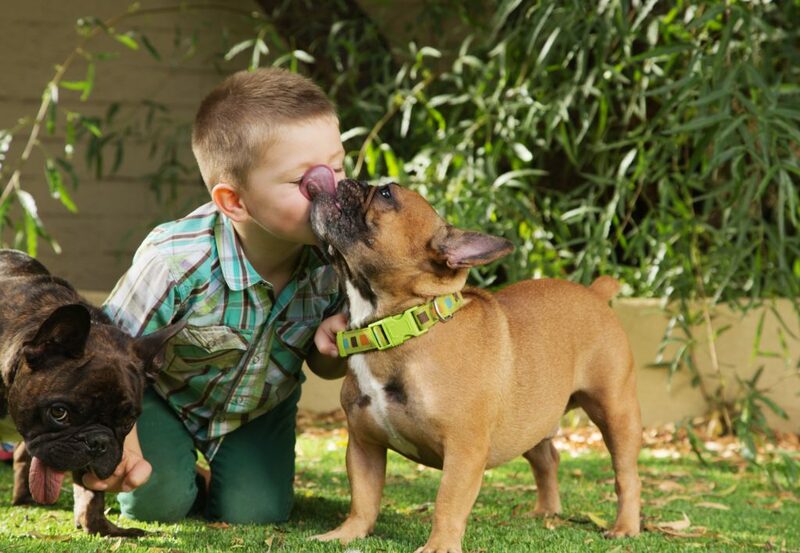 We’ll explore 5 reasons why you and your furry friends will love Artificial Pet Turf. The durability of artificial dog turf is one of its best qualities. You will benefit from turf that can last up to 20 years with minimal to zero maintenance. It stands up strong against years of use and unlike mulch, dirt, or natural grass; your pup won’t create unsightly pathways as she travels along her favorite route to the fence. In addition, the surface will stay even and smooth, even against tough use. You won’t have to worry about tripping into a rut that your doggy seemingly set as a trap for you, and she won’t be digging holes under the fence. Your dog will love rolling around in the soft, smooth artificial grass (and so can you, if that’s your thing. It’ll feel great). Not only does artificial pet grass stay cleaner, longer, but it’s also simple to clean and deodorize. Simply scoop up pet droppings the same way you would on a normal lawn and then hose off your turf (is needed). Superior drainage and modern layering allows artificial turf to drain quickly and efficiently so urine won’t cause a problem. If for some reason the area your dog loves to mark has any kind of lingering odor, you can give it a spray off with a garden hose and you’re done! While we’re on the subject of cleaning, let’s talk about the mud and dirt that accumulates all over your dog’s paws and claws after a rainstorm or just a vigorous run through the yard. It’s one of the biggest downfalls to owning a pet, and no one likes it when their pup runs into the house covered in mud or dirt. Artificial turf eliminates mud entirely, and its advanced drainage system keeps your yard mud puddle free. It also offers an area free of fleas, ticks, and other lawn pests! The amount of money you’ll save over the years by using artificial pet turf is one of the best reasons to invest in it as soon as possible. By cutting out any lawn mowing and weed-whacking, you save money on not only the heavy duty equipment needed, but also the mounting, continued costs of oil, fuel, and maintenance on each piece of equipment. Plus the time you would normally spend on lawn upkeep can be spent taking your dog for a walk as an owner, running your veterinary/doggie day care, or advertising if you run a dog park. 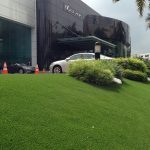 If you live in a dry climate or have ever had a dry spell, you’ve likely had to invest in a sprinkler system, but with artificial pet grass you can toss it by the wayside. In addition, you’ll be saving the accumulative water costs for an extended period of time. Other than cleaning pet waste, the only maintenance needed is a quick, periodic sweep of a leaf blower to remove any debris. antimicrobial, non-toxic fibers so that each synthetic blade is safe for your pet. You will also be discarding any dangerous fertilizers, insecticides, and weed killers as you’ll no longer need to use them, and you’ll never have to worry about ticks or fleas infiltrating your yard and clinging onto your pup. If installed by Genesis Turf, you will also have the benefit of ZeoFill Infill. This is the number one infill available for pets. ZeoFill is 100% organic, pet safe, and will not allow for odor build up. In the middle of the winter your dog won’t be walking along rough dirt and rocks, and you won’t be staring at a desolate wasteland for a yard. Artificial turf allows you to have a professional looking lawn year-round without all of the associated maintenance and costs. In addition, it’s simple to install and can be done in a matter of days. Your furry friends agree—this one is a no-brainer. 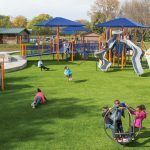 To learn more about how artificial pet turf can benefit your home, business, or park, give Genesis Turf a call at 855-887-3435. “Any modern day city park or large park. Artificial pet turf makes it easy to have a minimal maintenance, cost-efficient, easy to clean” —- So true. 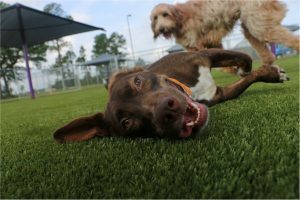 We watched you guys upgrade our local dog park with artificial pet turf and it’s awesome!